John is well known for his astonishing feats of memory – not only in retaining complex information about his client’s products, services and corporate philosophy – but also for being able to remember up to 100 names and faces (and personal details) of guests in the audience! 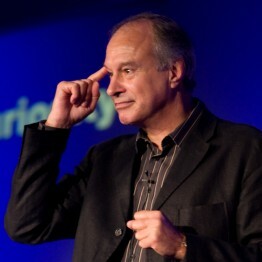 He has often led breakout sessions on memory techniques for business – especially the morning after an after-dinner speech where the audience are keen to know “how he did it”! John deconstructs the methods he uses into an easily assimilated format and backs it up with hand-outs summarising his modus operandi. Here’s an example of a different memory challenge he accepted – to demonstrate his mastery of names at a pre-dinner networking event, and follow this up with an interactive session after-dinner. Audience Size: 60, comprising delegates from many different European countries. Brief: John was asked to attend the welcome reception and to give a short introductory talk before dinner on techniques for remembering names at networking events. John was given the guest list prior to the event and learnt all 60 names of the delegates and in his speech mentioned them all ny name, including their company details and country of origin! He then proceeded to give a brief overview of how he did this, with tips for the delegates to be able to do the same. He then set them the challenge of finding out details of 3 different people during the dinner – and then facilitated a Q&A after dinner where guests were asked to tell everyone something they had learnt about their new acquaintances using John’s memory techniques! If you’d like John to help your delegates remember names, faces and information more easily – either as a main speaker – or as an “add-on” workshop to a keynote or after-dinner speech – please call him to discuss your event!